Happy Hump Day, everyone! I hope you are all enjoying your week. Have you checked out the Holiday Gift Guide and Giveaway blog hop that’s going on this week? Be sure to check it out and enter to win all 25 prizes! I’m sharing the DIYer’s Holiday Gift Guide AND giving away a HomeRight Finish Max Pro Sprayer! I originally made it to go over the mantel but, once I finished it, I thought there was too much white on white action going on (this was before my recent fireplace makeover when the entire fireplace wall was white). So instead I placed my Wood Shim Sunburst Mirror there. 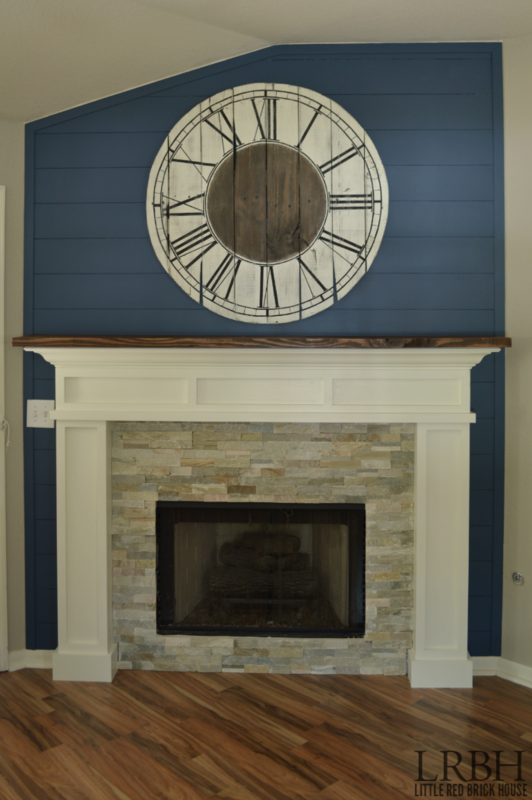 While I absolutely love that mirror and am so proud of how it turned out, this pallet clock has been in the back of my mind, begging for its rightful seat on the fireplace mantel throne. After watching it gather dust for months, I finally gave in and popped it up there. I’m glad I did because it spurred me to go ahead and make the changes that I wanted to the fireplace. And now that everything is finished I couldn’t be happier. 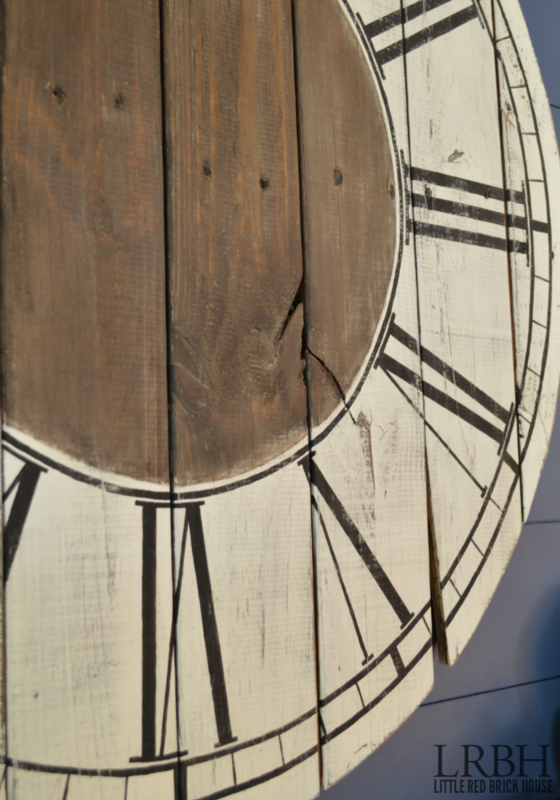 I knew that I wanted a really rustic and imperfect look for my clock and pallet wood totally fits the bill. This post contains affiliate links for your convenience. Click here to read my full disclosure policy. I cut eight pallet boards, lined them up and then placed two 1×3 boards on the back of them and screwed each pallet board into the 1x3s. 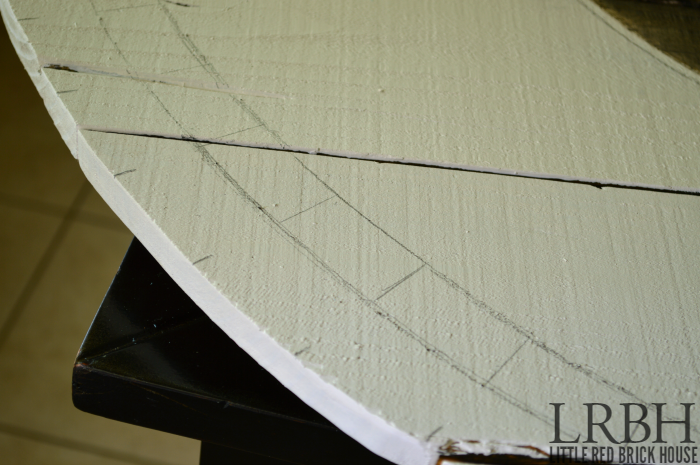 To get a perfect circle, I tied string around a screw and stuck the screw into the middle of the attached boards. Then I tied a piece of chalk to the other end of the string, stretched the string out to its length and traced my circle all the way around the boards. Then I just cut it out with a jigsaw. My circle ended up being 41″ in diameter. 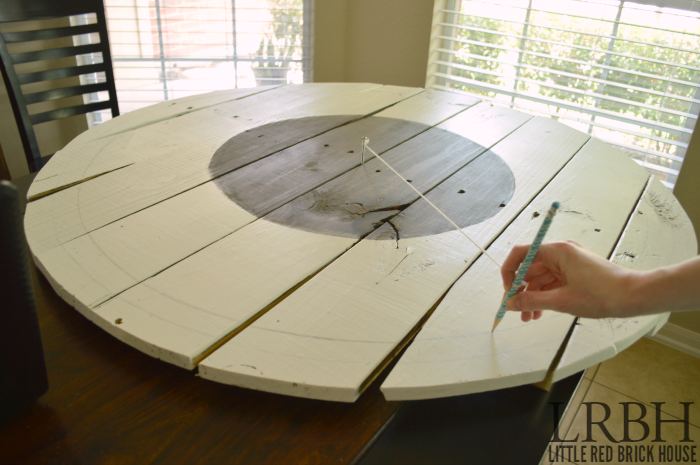 Once I had the basic shape of my clock, I stained the boards with Dark Walnut stain and then painted over the stain with white paint (Sherwin Williams Alabaster), leaving a smaller circle in the center unpainted. After that dried I used the same trick as I used earlier to trace a circle along the edge (about two inches from the edge) except this time I used a pencil. I traced another circle about an inch inside of that circle. Then I traced another one about a centimeter outside of the stained circle in the center of the clock. In between the two outer circles I drew lines for all of the clock minutes. This was done completely by eye and there was a ton of measuring and erasing going on. 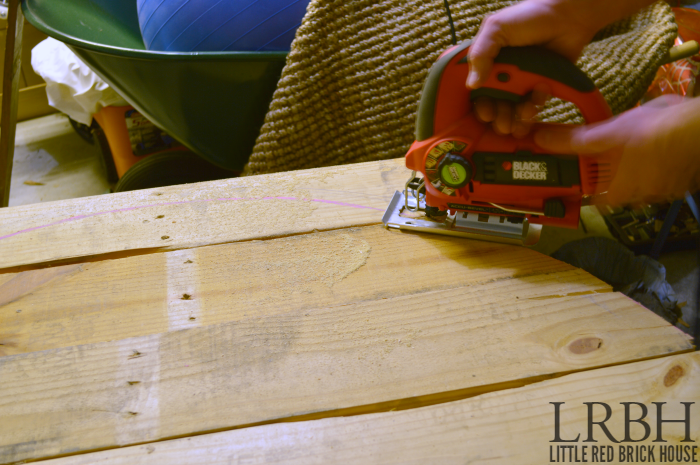 Then I painted over the line with DecoArt Americana Decor Chalk paint in Carbon. For the roman numerals I used a small ruler and hand drew each number with a pencil and then painted them in with the same black paint as earlier. This part was so tedious and time consuming. I may have uttered a few choice words. After all of the paint dried, I distressed the entire piece by gently sanding over it with an electric sander. I roughed it up a little bit more along the edges and in a few random spots just so it wouldn’t look so uniform. I did purchase clock hands to attach to it but when they arrived in the mail they ended up being too small. I thought about returning them for a bigger size but the hand-less clock grew on me. I think it’s sort of unique. It reminds me to stop always watching the clock; to just slow down and enjoy the moments that life brings. It’s my own accidental metaphorical symbol. I am so smitten with this clock. I want to make one for every room in my house but I will refrain. I don’t want to become known as the “Crazy Clock Lady”. I will be sharing my Thanksgiving tablescape on Friday so be sure to stick around for that! See ya then! Who cares if it has no hands! It’s awesome and looks perfect above your fireplace 🙂 That whole space is amazing! Ha ha! Thank you so much, my friend. Your kind words mean a lot. Oh my goodness! This is SOOOOO awesome! Looks amazing over your fireplace!!! Thank you, Kristi! I think the curves help to balance out all of those angles from the fireplace. Thanks for stopping by, friend! 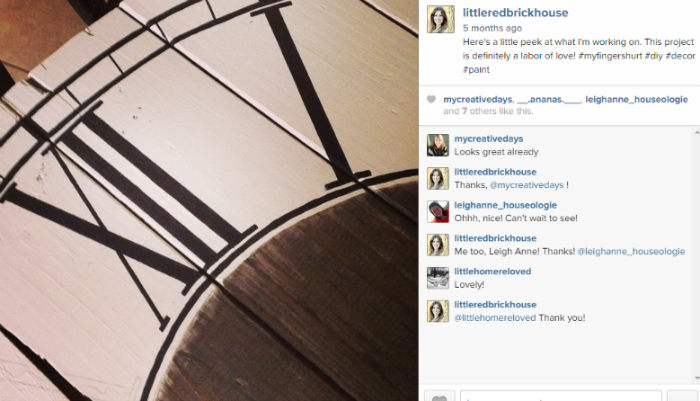 Sarah, you should be pretty smitten with your clock, it’s fabulous! Looks terrific with your updated fireplace! Thank you so much, Tara! You are so sweet! I have been looking forward to a tutorial on this kind of clock, yours it’s just amazing. Thanks for sharing !!! 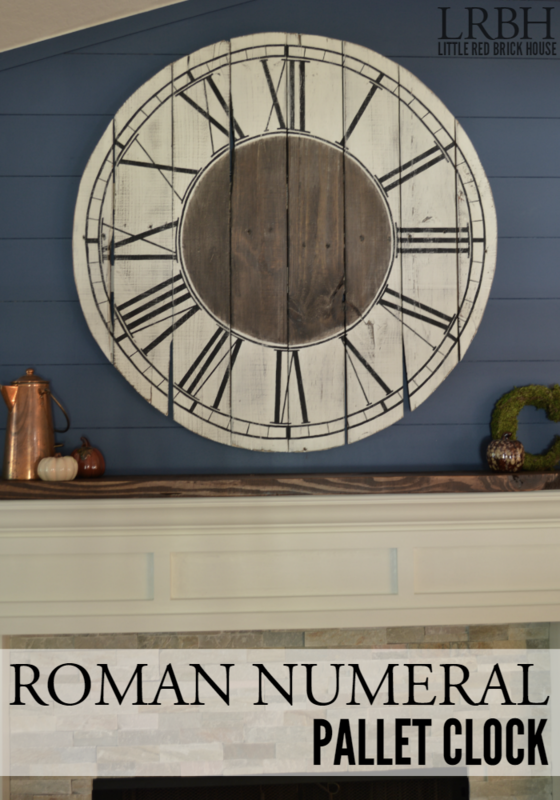 I am in love with the oversized clocks and yours just has such attention to detai, especially the use of the roman numerals. Can I just say that I adore the colour on the planked wall. Thank you so much, Gilly! You are so kind! It was a leap of faith to paint the plank wall that color but I truly love it and it brings so much interest to the space. Thanks for stopping by! So cute! I have to be honest, it would drive me crazy having a clock with no hands, but this is great! HI! I love your clock! I think I have a tip for you for future clocks you do; lay a piece of string around the outside and cut where the ends meet. Take it off, measure and divide the length by 60. Tick off the string with a sharpie the number you come up with and tape the string back around the circumference!! Transfer the tick marks and you now have your minutes spaced out evenly!! Keep up the great work!! Can someone go into detail with these instructions to get the numbers spaced evenly, he lost me at the tick with a sharpie ? I think he’s saying to use a string that is the same circumference as the circle. Measure the length of the string and then divide by 60 (the number of minutes on a clock). Then, using the number you just got from diving by 60, make a mark all along the string with that much space i between each mark. Then you wrap the string around the clock again and mark the clock where each mark on your string is. It is kind of hard to explain but I think I know what he means. 🙂 Hope that helps! Sarah, your clock is lovely! I have a nice stash of fence pickets and I’ve been dying to make a huge clock out of the pockets. I’m eventually gonna get around to it. Thanks so much for this tutorial. I’m sure ill find the hand lettering just as painful. Thank you, Pam! You are so welcome. Fence pickets will look amazing! Just take lots of breaks during the lettering, LOL. Do you make this for other people? How much to make me one? I LOVE THIS SOOOO MUCH !!!!!! Thank you so much, Nancy! I’m so flattered! I don’t make them for resale right now but I have been thinking about it. I will definitely let you know if anything becomes of it! I’m definitely going to be looking into it. I appreciate your support and encouragement! Fabulous!!!! Can you tell me how tall your numbers are? Hi, Tammy! Thank you so much! The numbers are 7 inches tall. Do you mind me asking how wide? Hi, Francine! It’s no problem at all! My clock measures 41 inches wide. Thank you, Brandi! That is so awesome! I’d love to take a peek at it when you’re all finished! Love the clock so much I am making one myself!!! Can you tell me what brush you used to free hand your circles? I am having a hard time getting the circles not coming out nice and smooth. Guess my hand isn’t super steady. Any helpful hints would be greatly appreciated! Thank you so much, Lisa! How exciting! Honestly, I just used a cheap craft brush that came in a pack from Michaels or Hobby Lobby. I bought it such a long time ago that I can’t remember where exactly. I’m sorry! It’s not any kind of specialty brush though. My hands were definitely shaking, too. My best advice is to try it during a quiet time where you’re not stressed or distracted and to have a damp rag on hand to erase any mistakes before they dry. Take your time. This took me a few days to complete. Also, nothing is permanent. For any black paint mistakes I noticed after they were dry, I just cleaned up the edges with a little bit of white paint. Hope that helps! Thank you, Christy! LOL! Yes, this was a patience testing project, for sure! But it was totally worth it. Thanks for stopping by! Great idea !!!!! I liked the clock so much, I am making my second one. Instead of using paint for circles and numbers I used black permanent markers. It make for perfect lines and circles. Also my center stained circle was 10 inches from center. Thanks again for your beautiful DIY. That’s awesome, Sandy! I’m so glad you tried it out. And using a Sharpie is a genius idea! Hi, I made a clock just like yours. Thanks so much for the tutorial! It was a lot of work, but I love the finished product. Could you please tell me what you used to hang yours? Hi, Melanie! So exciting! I’d love to see it if you’d like to share. To hang mine I used this perfect picture hanging kit (affiliate link). I hope that helps, and if you have any other question please feel free to give me shout! Thanks, I’ll see if I can get that or something similar. I would share my clock, but I’m not sure how to add a picture here. Going to try this! 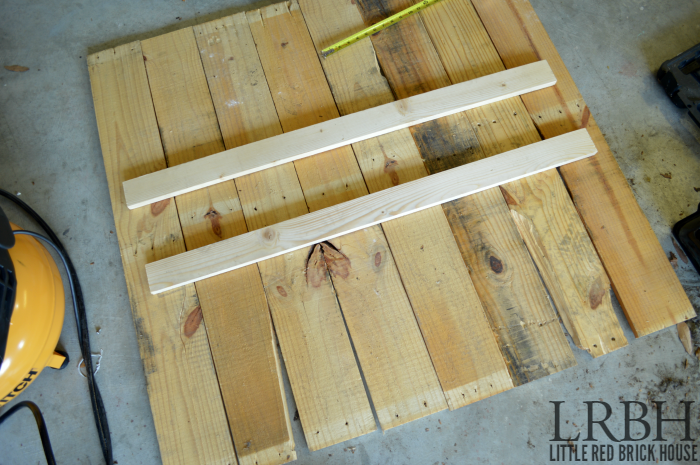 Do pallets come in different widths? Mine is not close to 41″ when laid out. I think I need 11 boards. Awesome, Linda! I do think they come in different widths. It doesn’t have to be exactly the same width as mine though. It think would look amazing in any size. Good luck! I am the crazy clock lady. I LOVE clocks! 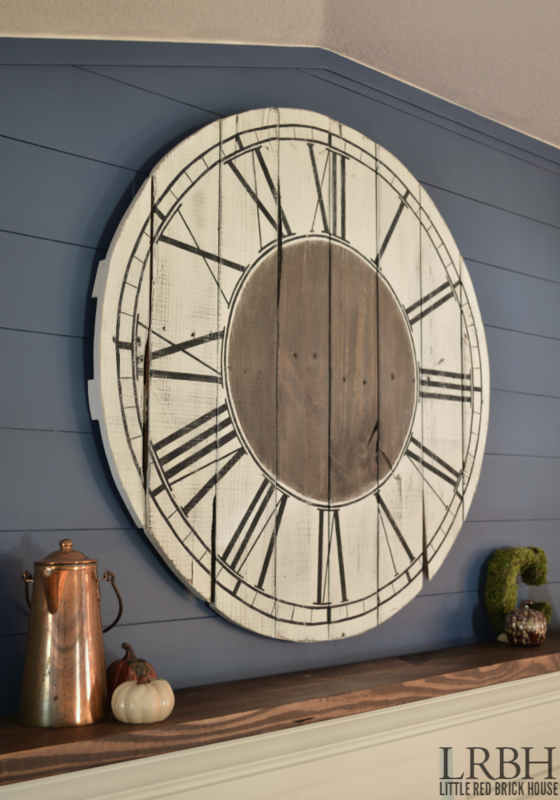 I’m am so making this clock for my huge blank wall in my dining room. Thank you! !